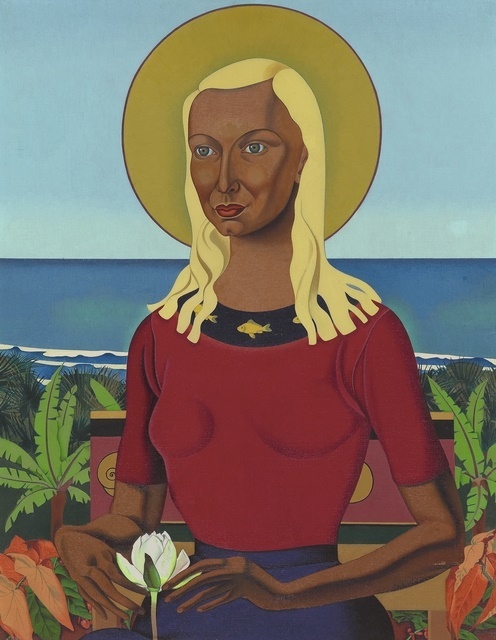 University of Auckland student Susannah Whaley has spent her MA year intrigued by Rita Angus’s goddess portraits. As our guest blogger, she focusses on three fascinating, but little-known works, and asks whether they are self-portraits, goddesses, or both. Rita Angus (1908-1970) is an iconic and much-loved New Zealand artist. Her bold, experimental style is immediately recognisable in the landscape paintings that form such an essential part of our cultural history and heritage. Angus is equally renowned for her goddess paintings, especially Te Papa’s Rutu. The brilliant colours and sharp lines, the blonde hair and dark skin, render it an emblematic image of racial and natural harmony. Labelled ‘Self-Portrait’, Rutu might be Angus herself. An alternative view emerges in Angus’s letters to the father of her miscarried child, the composer Douglas Lilburn. Angus told him: ‘The “Sun Goddess” is your child. She is mine.’ She becomes Angus’s creative, living legacy. But Rutu is not Angus’s only ‘goddess’ at Te Papa – there are other portraits of mysterious women in the museum’s collection. These are lesser-known works, on long term loan from the Angus Estate. Who are these women? Are they self-portraits? Are they goddesses? Like Rutu, they belong to the 1940s and early 1950s. This was a period when Angus ardently proclaimed her pacifist philosophy and reformulated her beliefs about how she should live and practice her art. She described herself as a ‘high priestess […] responsible to myself and to my work’. The following three works are sketches expressing the formulation of ideas of peace and ethnic harmony which accompany Angus’s larger goddess canvases. 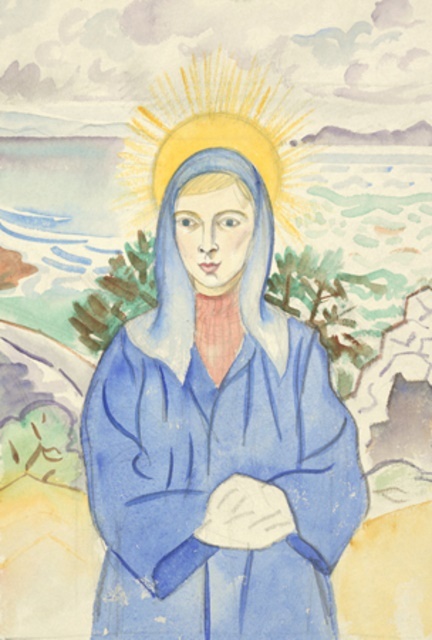 Figure at Sumner (about 1949) is a watercolour sketch of a woman in a blue robe and veil, invoking the Virgin Mary as ‘Our Lady, Stella Maris’ – Star of the Sea. The halo or sun behind the woman’s head marks her as divine and also appears in Rutu and Sun Goddess. As this sketch probably dates from the same year as the letter, Angus was likely experimenting with tartan here as in Rutu. The figure in this picture stands at a juncture of sea, sky, and land. There are probable references to colonisation in the blond woman wearing her tartan, dressed like the Virgin Mary (who gives birth to the child who is supposed to bring peace to earth and between races), standing on the New Zealand shore. But there is also a sense of peace and harmony: the bush, the landscape, embrace her. The hands, clasped together, are unfinished. The hands are often rough in Angus’s sketches, as is evident in the other two pictures discussed here. Perhaps this lapse indicates that she intended to rework the composition. Angus’s practice was to sketch and block out ideas before transferring them to large canvases. 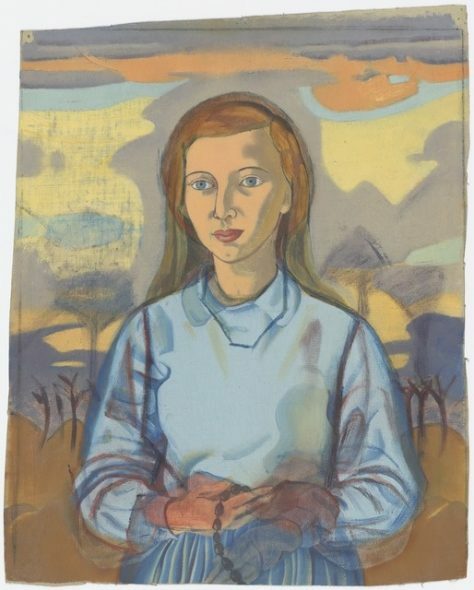 Without a halo, and labelled only as a ‘Young girl holding beads’ (about 1950), this second woman echoes the calm, utopian mood of Angus’s major goddesses. The natural, symmetrical landscape and the slight turn of the figure towards the viewer’s left are common elements of other goddess portraits found in this small oil. The young woman holds what appear to be prayer beads – Angus herself was raised Anglican. Dressed in blue with a translucent dark veil over her brown hair, the woman resembles another sort of Mary. If she resembles her artist, it is in the shape of her face and aquiline nose, similar to Rutu and numerous other self-portraits. Her lips are rounded and a small dimple is discernible on her chin; Angus often draws her own chin with a cleft. The backgrounds of Figure at Sumner and Young girl holding beads are almost symmetrical. In the first, the coastline curves up and away from the woman towards the edge of the sheet, while the bush growing behind her indicates that she is the middle point. The second provides a symmetry of trees and brown earth. While the clouds are not perfect mirror images on each side of the woman, they curve up and around her head in a way that emphasises her. These women are encased within their landscapes, and convey a feeling of completeness and wholeness very similar to Rutu and the major goddess canvases, A Goddess of Mercy (Christchurch Art Gallery) and Sun Goddess (private collection). All the goddesses are independent images. The woman fills her frame. Her elbows angle out rather than in, giving her more width and presence. 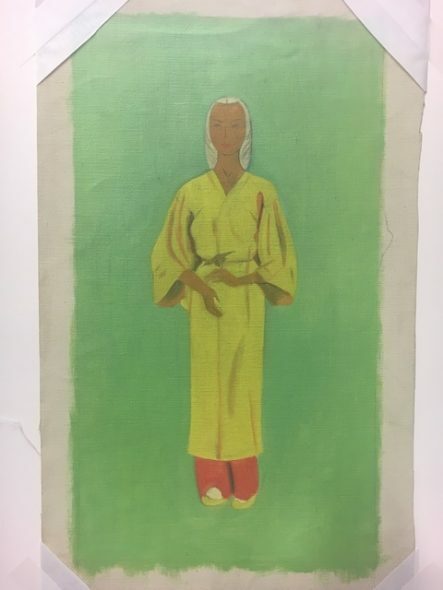 Last but not least, Angus painted Self-portrait in Oriental costume around 1946, earlier than the two works discussed above, but near in time to when she began Rutu. The partially painted woman is also dark skinned, wearing a green oriental robe with red trousers and green shoes. Her hair has either not been coloured, or left white on purpose. Maybe, like Rutu, she was intended as an interracial figure. She holds her hands in front of her in a gesture that is quite similar to Rutu, while a bird rests on her upper hand. With the left hand lowered and the hand on the right drawn overtop, she recalls the Buddhist goddess of mercy and compassion, Kuan Yin. Kuan Yin is a virgin goddess – like those above, a worthy icon of female independence. These little-known goddesses show Angus recasting women, race and divinity, as she does in Rutu. So are these self-images? Quite possibly. Similarities in feature might be explained away by the artist’s use of herself as a model, but the goddesses do seem to articulate Angus’s pacifist views. All three appear alone, and in the 1940s Angus, came to consider solitude as essential to the success of her painting. She had also gone through a divorce in the decade before. If we consider the goddesses as self-images, then they surely relate to the work of Angus’s contemporary Frida Kahlo, who translated her face and body into fantastic forms and settings. As with Kahlo, Angus’s works closely relate to the events of her own life. They highlight the sense of female independence that Angus cultivated as a painter and a woman. One thing is for sure – there is more to Angus’s goddesses than meets the eye, and these sketches are worthy of the name. Bronwyn Lloyd, ‘Daemons and Dream Children: The Secret Lives of Rita Angus’s Symbolic Portraits.’ PhD Thesis, University of Auckland, 2009. Jill Trevelyan, Rita Angus: An Artist’s Life. Wellington: Te Papa Press, 2008. I have wondered if ‘Figure at Sumner’ c 1949 may depict Helen Hitchings? By 1949, Rita was acquainted with the gallerist whom she had met in Wellington. Helen was a young blond haired woman of 29 years, with very clear features. The way she championed art and design (including Angus) through her gallery meant a great deal to the artists showing in her Bond Street gallery. I love the focus on specific, heretofore neglected works by an artist as rich as Angus. But there’s a long-standing tradition of sexist appraisal of female artists which sees them as solipsists who can’t get beyond the narcissism allegedly essential to women, so we need to be wary of ‘reducing’ such images as these to self-portraits. Thus I’d be just as interested in the project of identifying the female acquaintances Angus had from whom she may have drawn inspiration, however obliquely. This would take us into the realm of sisterhood, you might say – a nicely feminist agenda. These portraits can absolutely not be defined as simply ‘self-portraits’ – either the unknown pieces or the more well-known Rutu. They are more complex than this. In Jill Trevelyan’s excellent biography of Rita Angus mentions Angus’s description of the goddesses as her children. They similarly can be read as goddess/Madonna-like images heralding a new age of peace, which Angus as a pacifist hoped for after the second world war. It is too much to get into within this short blog, but a very rich study. The element of self-portraiture which might exist in them is just one interpretation. I shall throw down the gauntlet Susannah and say these are not major Anguses, nor even particularly strong works. However, as your excellent blog helps explain and contextualise, Rita distilled them into ‘Rutu’ – and here she really nailed it! I’d say they are intrinsic to major workings and ideas within Angus’s art at this time, related to feminism and divinity. I like to think of them as major in this sense, even if not in the ‘traditional’ sense of a major work of art! Rutu is a part of this as well.